Citizen Office taps Naoto Fukasawa, the Bouroullecs, and others, to create a contract furniture collection perfectly suited to the relaxed work environment of the day. ?We believe you should use an office like you would a city,? says Jo Kaiser, managing director of the North American operations of Vitra. Kaiser is explaining “Citizen Office,” a concept the Swiss-based furniture maker initiated in 1991 for an eminently configurable workplace environment that gives employees full range of the space. Almost 20 years later, Vitra is introducing some inventive new products that push the concept even further. 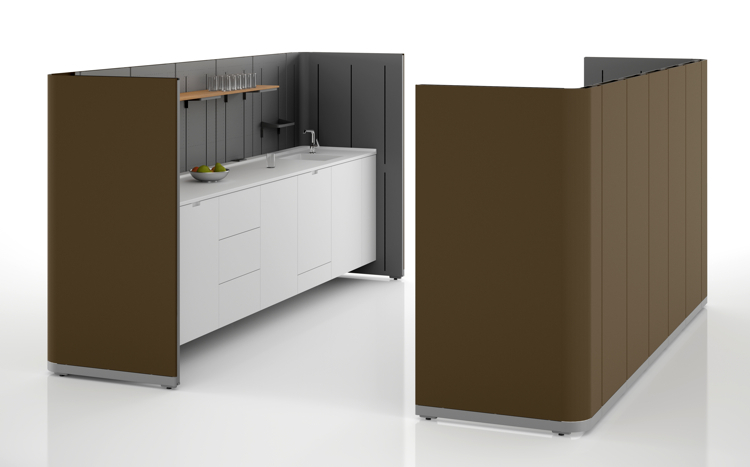 The latest collection — which has everything from sound-dampening room dividers to tables that double as lockers — gets at the crux of the informal way people work today. In the age of mobile technology and Xboxes in the breakroom, the old workplace hierarchies no longer apply. 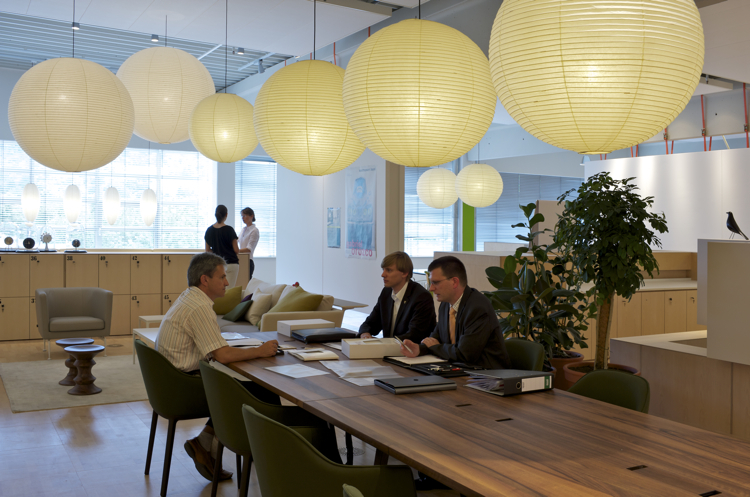 Instead, we’re seeing the rise of open-plan offices that take their design cues from how people actually want to work. Vitra believes the new model discourages repetitive movement and sedentary positioning that can put too much strain on the human body. And it claims workers are 30 percent more productive. Consider the “Communal Cells” by the French design duo Ronan and Erwan Bouroullec. Communal Cells are movable walls and acoustic neutralizers in one that can be used to set up little islands anywhere in the office. That means that, depending on your office’s plumbing, you can have a mini-kitchen smack dab in the middle of your work pen — or a coat room or printing center, for that matter. Workers can set them up however they want. The moveable cells create a nice visual barricade, tucking away unsightly cords, and can quiet the incessant hum of office machines (and neighbors who spend all day on the phone). Depending on market reaction, the product will hit Vitra’s catalog sometime next year. 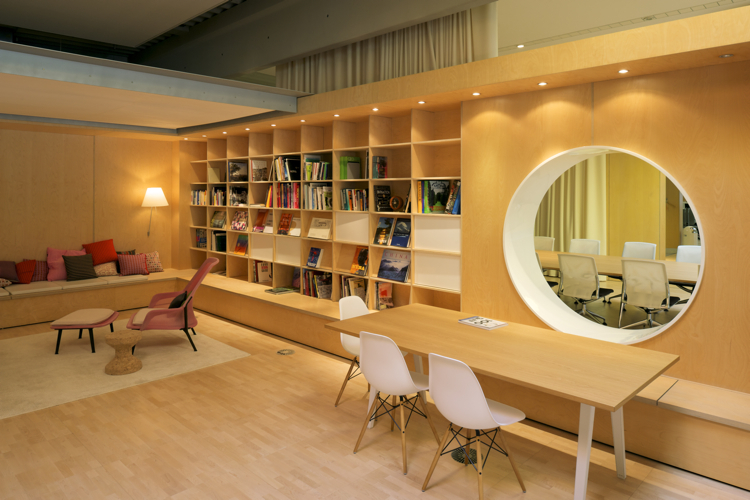 Vitra is also introducing sofa-desk hybrids that take the notion of workplace relaxation and elevate it to high art. 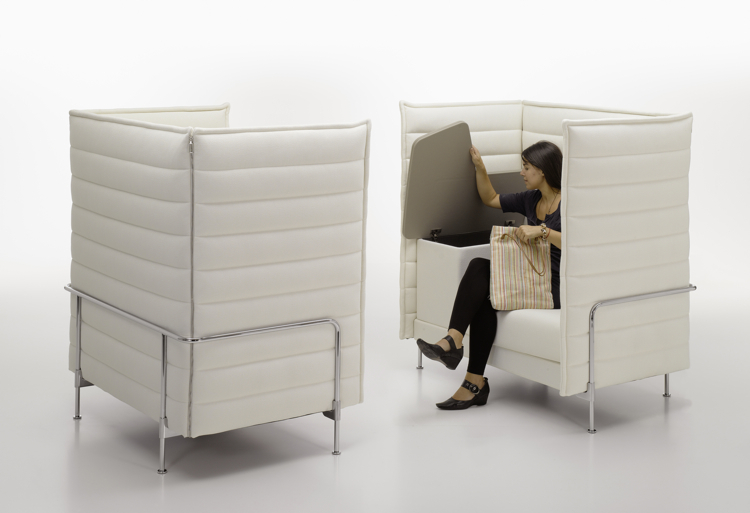 “Alcove Work,” by the Bouroullecs, is an office-sector extension of their 2006 privacy lounge concept, the high-backed “Alcove Sofa.” Here, they took a lounge chair and added a removable tabletop surface with storage. You can use it to tap away on a laptop or, let’s face it, take a nap. The list price is estimated at $8,000. Even conference tables are getting a makeover. Designer Naoto Fukasawa weighs in to Citizen Office with the minimal yet ingenious Kuubo. It was unveiled recently at Orgatec, Europe’s biennial fair for contract furniture. The basic structure isn’t new ” it has a flat veneered surface and four metal legs like any other table. But the ?aha” moment comes at the lockable storage compartments, which you can access from the tabletop. Ever have a 15-minute break during a meeting, but you don’t want to leave your stuff behind as you toddle off to the vending machine? Open the compartment, stow, and lock. It also gives visitors temporary storage so they can move about a company’s space without worrying someone will steal their purse. The name comes from the word for aircraft carrier in Japanese. With the sleek table surface and hidden hatches, it’s easy to see why. It’d be easy to dismiss Citizen Office as shtick. Do companies really need plush desks and fancy mobile screens? Vitra reckons so, and the proof is in their numbers. For years, the company struggled to compete with American manufacturers who always won on price and volume. But the popularity of the open-plan has given Citizen Office new resonance. Vitra’s sales figures are up 40 percent over last year — astounding when you consider there’s a recession going on. To better explain the virtues of Citizen Office, Vitra has just opened a full-scale workplace model on its campus in Weil am Rhein, Germany. From where we sit, it seems perfect for the person who wants to work at home but needs to work at work.